In the 4th book of the Looking Glass series, the storyline's undergarments are starting to show. 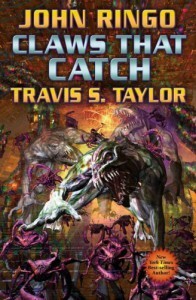 The formula of the third book (Manxome Foe) is repeated: first 60-80% of the book is about "they flew there" and "they flew here" and the "marines made fun of the CO", then the final part is about a big space battle with exotic ships and weapons, alien allies and enemies and the hard-fought victory by the key characters, all of whom manage to survive and are in fact the heroes. The final battle is probably worth the effort (to both writers and readers), although this probably could have been a short story rather than the novel length treatment here. Hopefully, this marks the end of my military fiction binge as I am all gung-ho-ed out. Need to stop jumping to attention for Semper fi!